Instant messengers are integral part of our life these days helping us to connect to our friends, family, coworkers and many more easily providing us many useful features to use with. These instant messengers come with many unique features with many of them related to privacy. We will talk about one of them, i.e. the invisible feature which makes people invisible from their friends or family . We will talk about this feature being specific to Google Gtalk. 1. 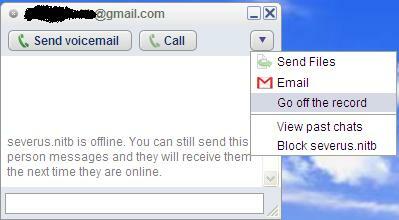 Open the message window for the contact for which you want to find out whether he is online or not. From the side menu from the down arrow in the window, select Go off the record. 2.Now send any message like say “hi”, dont worry if the person is really offline he wont get this message when he comes back online because you have set the chat off the record. The chat wont be saved in either of your gmail accounts. 3. Now if the person is really offline you will get a red message saying “@gmail.com is offline and cant receive your messages right now”. If you dont get any message like this that means that the person is invisible and not offline. Give it a try and leave your feedback here. also tell me if it worked for you or not. If you know any other way of finding invisible people onÂ any other IM too please do talk about it in comments. 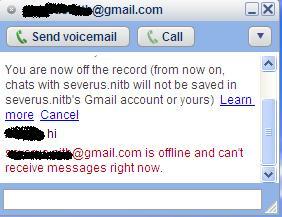 cant i do this in gmail, without signing into gtalk and by being invisible? 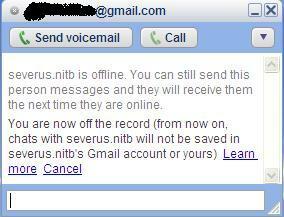 well, i havent checked whether it works on gmail or not. I will try to find out if this works or we need a new trick. thanks for the useful advice. Just an add-on.. For people who wish to remain invisible in gmail and avail this trick, they can do it once in gtalk and then log out.. When u login through gmail, u will find it off the record all the time till u change it.. so can remain invisible and still find out!! hope this helps!